We moved into our new space a little more than a month ago, and I thought maybe it was time (yes, perhaps long overdue would be more accurate) for an update. In our former home, all of the books (mostly) fit on the wall of bookshelves my husband built. In our new space, at least for now, we’ve resorted to an older shelf he re-built four dwellings ago now. In Siloam Springs, it was in my yarn room, holding patterns and stitch dictionaries and works in progress. I’ve got two shelves of books I’ve already read, but I only unpacked the book boxes marked TBR. 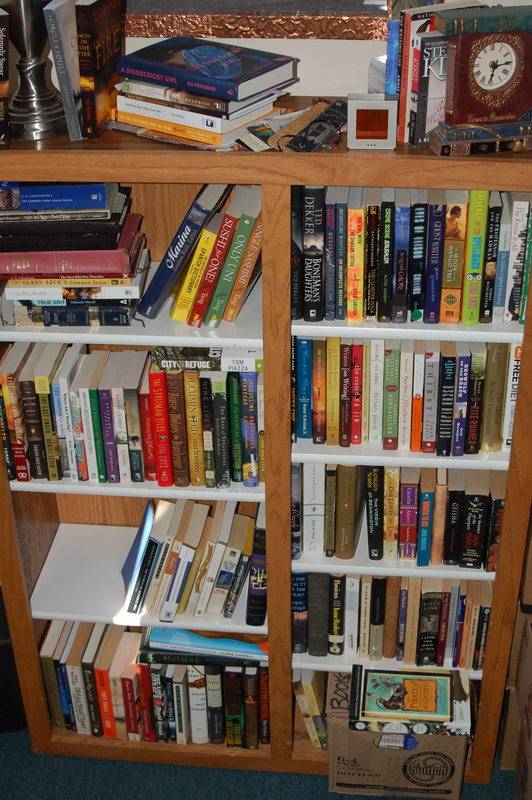 As you can see, the books aren’t contained within the shelves. 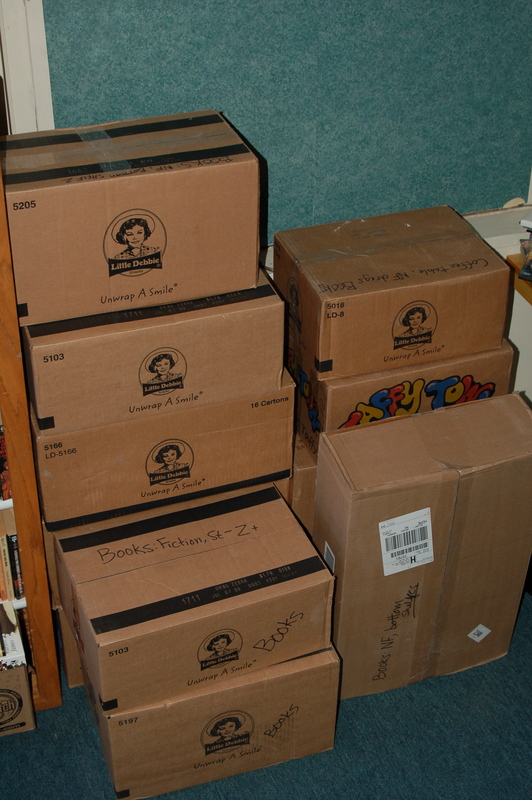 And these are the boxes of books that I didn’t even open. They’ve since been moved from their place beside the bookshelf to storage. We’re clearly still working on getting settled. Yesterday I spent more than a few hours working on the roman shades we’re attempting to make for the 7 large windows in our space. Bookshelves will come, in time. The current state of them is somewhat indicative of my current state, though, I think. We’re still in transition. It normally doesn’t take us this long to get settled in a new place, but this time, everything’s a bit more complicated, so it’s taking longer than I expected. It always takes time to get settled. We’ve been here two years and my books still aren’t arranged well. I just have to know: What’s with all the Little Debbie boxes? Perhaps you had party and Little Debbie donated treats?! Or did you heist a LD delivery truck? No, none of those reasons! 🙂 The company has a plant in the adjacent town; the boxes are ubiquitous, as are the treats. There’s a company store there, too, but I’ve never been. Driving through the town is a very sweet proposition, though! I can’t believe they’re boxed up alphabetically. That’s organization! Books are the hardest thing for me to move. So far, I’ve always been able to move gradually, over the course of about 15 days – the books take SO LONG to box and move and reshelve. But it is fun to buy new bookshelves! Well at least you know what is inside each box. Getting settled takes time. Unpacking books is the perfect rainy day activity so give it a month or two, make some comfort food and then dedicate some time to it. It will be more enjoyable that way. That reminds me why I’m not in a hurry to move from our place! Books take an incredible amount of space and boxes! I’m impressed that you managed to separate TBR books from Read books so well. You need to teach me some orgaznisation skills! I always find unpacking books to be both painful and enjoyable. I love coming across long forgotten gems (or much neglected tbr books I am pleased to re-discover) but actually getting them back up and in a semblence of order is dreadful. Do you love the Pirates books like the one you have sitting on the box at the bottom of the bookshelf? I have been thoroughly entertained by them although the latest one was a bit disappointing to me. That’s the only Pirates book I’ve read; I didn’t know quite what to expect of it, so it took me awhile to start enjoying it, but I suppose I did like it. I’m not sure I’ll seek out more of them, though. Wow, you are much more organized than I ever was when moving books! I’m impressed! Agree with the others that it takes time to settle into a new home. And the last thing that you want to do is just throw things anywhere, as then you have to rearrange everything. Two things I love in life: Books and Little Debbie. Well, I love more than that but they are high on the list. I love the pictures of the LD boxes full of books. It makes me want to write a poem. Except I don’t actually write poetry.